Here are a few useful links to find races that are local to the 3 Cheap Runners...thanks to friend of the Runners Jeff Rowell (@Runs4Coffee) for the 'Get Out There' link! A Half Marathon at Walt Disney World in Florida for Michelle & Rhoda and a half and full marathon for Mike. Mike ran the 5K with the kids in a frigid but fun race. Mike & Rhoda both ran the 10K, Mike taking 5th overall and Rhoda snagging 2nd female. The oldest race in North America, a 30K road race in Hamilton Ontario. Recaps from Mike, Michelle & Rhoda. All three of us are did this race along with Kennedy and Rhoda's sister Miriam. Mike, Rhoda and Miriam all ran the half marathon while Michelle and Kennedy took on the 5K. Michelle ran her first local Half Marathon, Mike took age group honours in his Half and Rhoda ran the 10K as a tune up for her marathon. A RunDisney event for Michelle and Kennedy! Mike will be taking part in his first Half-Iron distance race, which means a 1.2 mile swim, 56 mile bike and 13.1 mile run. The race is in the Finger Lakes region of New York State. We ran this 5K together and finished in 29:37. I was pacing Michelle and my goal was to finish under 30 minutes...good job Michelle! I also ran the 2.5K with our daughter Kennedy and she finished her race in 16:50, good enough for third in her age group! Michelle ran the 5K with Mike's sister Emily, finishing in 40:08. Mike's Mum Sue also ran the 5K with a PR of 32:34. 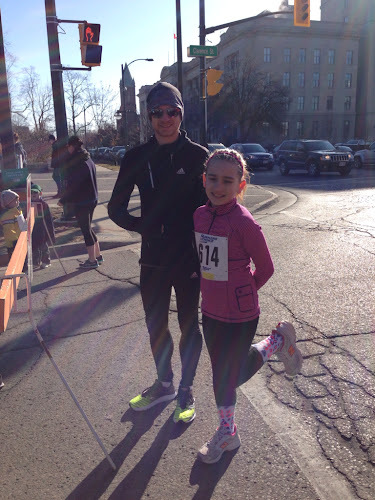 Mike & Michelle's daughter Kennedy ran the 2.5K in about 18 minutes (no timing available). Mike ran the Half Marathon in 1:31:08. Michelle ran the 10K with a time of 1:03:11, while Rhoda (1:44:11) and Mike (1:30:18) both ran in the Half Marathon. Michelle paced Mike's sister and Mum in the 5K (35:20), while Mike did the 15K race (1:01:59). The races took place at Fanshawe Conservation Area. Michelle ran the 10K with the MIL and Rhoda ran the 10K as well and placed at 48:45. Mike ran the 5K with the kids and finished second-last. Mike ran the 10K and had a PR of 38:24 for the win!